Through the centuries, the passion for gold has led many on a fruitless track into the unknown. Possibly the most well-known of such voyages commenced with a story of a native man who lived inside the vast interior of the mythical Andean planes. According to legend, this Muisca king would cover himself with gold dust during a ceremony, after which he would dive into the Lake Guatavita from a raft and his people would throw precious jewels at him to appease the underwater gods. When early Spanish explorers arrived in South America in the 16th century, they heard about a tribe of people living high up in the Andes of what is now Colombia. They heard that when a chieftain rose to power he would be initiated with a ceremony at Lake Guatavita, which later on became known as the ceremony of ‘El Dorado’. One of the most detailed accounts comes from Juan Rodrigez Freyles’ 1536 book The Conquest and Discovery of the new Kingdom of Granada. He tells that when a leader died, his successor was called ‘the golden one’ or ‘gilded one’ and had to spend time by himself in a cave without salt products or being allowed to leave. His first journey thereafter would be to the ceremonial lake of Guatavita. Surrounded by four priests adorned with feathers, gold crowns and body ornaments, the leader, naked but for a covering of gold dust, would set out to make an offering of gold objects, emeralds and other precious objects to the gods by throwing them into the middle of the lake. ” The heir was stripped naked and covered with mud and powdered gold” – Juan Rodrigez Freyle. The shores of the circular lake were filled with richly adorned spectators playing musical instruments and burning fires that almost blocked out the daylight from the lake basin. The raft itself had four burning fires on it throwing up plumes of incense into the sky. When at the very centre of the lake, the priest would raise a flag to draw silence from the crowd. This moment would mark the point at which the crowds would commit allegiance to their new leader by shouting their approval from the lakeshore. This story had been told over many years and in many different guises, but the published evidence of the story made Spanish invaders believe it was true, and it inspired many explorers to search up and down the country looking for gold. It even led them to believe there must be some hidden source of gold from which the Muisca people drew their riches, which was enhanced by the supposed findings of a map which located a lost city full of gold. Captivated by the monetary value of this possibility, they had little understanding of its true value within Muisca society. European minds were simply dazzled by just how much gold must have been thrown down into the deep waters of Lake Guatavita and buried at other sacred sites throughout Colombia since the beginning of Muisca tradition. In AD1537 it was these stories of El Dorado that drew the Spanish conquistador Jimenez de Quesada and his army of 800 men away from their mission to find an overland route to Peru and up into the Andean homeland of the Muisca for the first time. Quesada and his men were lured ever deeper into alien and inhospitable territories where many lost their lives. But what Quesada and his men found astounded them, as the goldworking of the Muisca was like nothing they had ever seen before. The exquisitely crafted gold objects were made with techniques beyond anything ever seen by European eyes. And fascinatingly, many aspects of the Spanish interpretation of events have been validated by painstaking archaeological research – research that also reveals the exceptional skill and scale of gold production in Colombia at the time of European arrival in 1537. Incredibly, a gold raft depicting a scene exactly like that described by Juan Rodriguez Freyle was found in 1969 by three villagers in a small cave in the hills just to the south of Bogota. This scene of a man covered in gold going out into a sacred lake, such as Lake Guatavita, wearing a huge feathered headdress is evidence for the existence of ‘The Gilded One’ within Muisca culture and the ceremony surrounding his initiation. 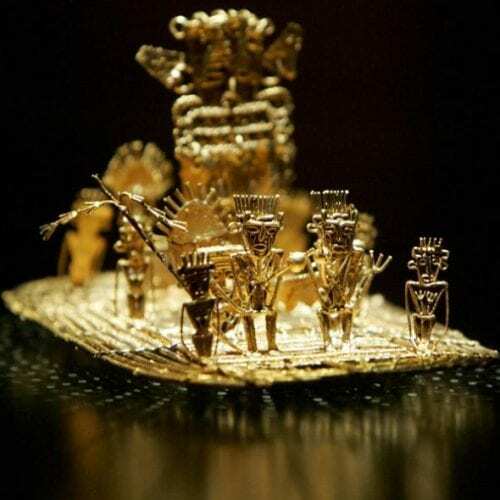 The above artefact is currently on display at Bogota’s Museo de Oro, gold museum, along with many artefacts found in the Lake Guatavita, and have great historical significance well beyond the legend of El Dorado. What many don’t know is that the Muisca empire flourished for over 1.000 years between 600 and 1600 and covered an area of approximately 25,000 km2, they were one out of 4 advanced American empires alongside the Incas, Mayas and Aztec. Just like many of these other pre-Columbian civilizations, they idolized the sun and had a special reverence for sacred sights. At these sites they would leave votive offerings, tunjos, as they were considered a portal to other worlds. One of the most important Muisca gods is Zue the Sun god and their votive objects were usually made out of ‘gold’ to mimic the radiance of the sun and thus pay respect to Zue. Muisca goldsmiths were true artisans, paying much attention to detail they were well ahead of their time. Employing a wide range of techniques in their work such as lost-wax casting, depletion gilding which gives a two-tone finish, repoussè, soldering, granulation, and filigree. Gold was also made into thin sheets by hammering on round stone anvils or carved stone moulds using an oval hammer of stone or metal. Indeed, to us it is a perplexing thought to know these gems were deposited into some lake or other sacred site within a matter of days or even hours of their completion. According to archaeologist Roberto Lleras Perez, an expert on Muisca gold working and belief systems, the creation and use for Muisca metalwork was distinct in South America. This signifies all the more the dedication the Muisca put into keeping peace with their environment and ensuring the balance of the cosmos would be secured. Unfortunately, the conquest of Colombia by the Spanish forced the Muisca people to leave much of their millennium old habitat behind for Indian reserves around the Colombian capital of Bogota, from which they were obligated to fight in the army or work the land. The number of Muisca declined rapidly from 500,000 to become mostly assimilated with the rest of the population in the 18th century. After independence in 1810, much of the reserves were dissolved but those remaining decendants of Muisca culture, making up about 750 families, are still living in indigenous councils in the capital city, Suba being the most well-known of these councils. Despite their numbers being few, they have proposed cultural and linguistic recuperation during their first general congress held in 2002, in collaboration with the the National Indigenous Organization of Colombia. Most of the work they currently do is centered around the revival of natural reserves which were once governed by Muisca civilization and creating awareness about the revival of a cultural which was once deemed decimated.